In January, the Breen School began integrating kindness into our everyday school community. All staff has implemented ways of showing students what it is to be kind and how to show kindness. We celebrated the Random Acts of Kindness week in February and now we have ended March with a celebratory Acts of Kindness March around the school. On Thursday, March 28, Prekindergarten and Kindergarten students all proudly participated by making a craft to show how they are kind and how their classroom shows kindness. 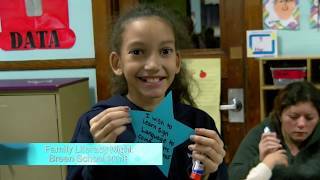 Welcome to November 2018 Family Literacy Night at the Breen School.